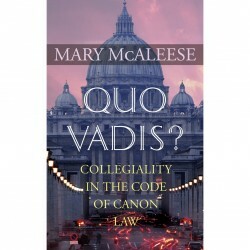 This January, Columba Press will publish Quo Vadis? Collegiality in the Code of Canon Law by Mary McAleese (former President of Ireland). The publisher’s description follows. In her first book since leaving Aras An Uachtarain, Mary McAleese has produced a masterful and highly accessible study of how Vatican II’s teachings on collegiality, or how power and responsibility were to be shared between the Pope and the college of bishops within the Catholic Church, have either been sidetracked or not yet come to fruition, depending on how you interpret the events which followed the Council up to the present day. Fifty years on from Vatican II, however, there is neither an orderly progression nor a fully choate story. Some commentators caution that Vatican II must be seen as a ‘slow burn’ with still unharvested potential for change. Others see the debate about collegiality as over either because the Church, in their view, already has ample collegiality or because collegiality has died on the vine. Against the background of ‘silencings’ by the Vatican of Irish priests, and the results of the Association of Catholic Priests recent survey of Catholic attitudes, this thoughtful and balanced assessment of what happened to the notion of sharing power and decision making within the church is very timely. Written by a highly respected public figure who served as Ireland’s President for 14 years ( and who would arguably have won a third term if the Constitution allowed) Quo Vadis? is a timely contribution to the ongoing debate within the global church on where we are going, or Quo Vadis?